Agnès Varda, a Belgian-born French filmmaker whose work prefigured and came to epitomize the French New Wave, died Thursday, March 28, at her home after a battle with cancer, the BBC reports. A commercial photographer early on, Varda was drawn to fine-arts photography and film, deciding to make her first movie — La Pointe Courte (1954) with no experience in the medium. An intense film about a couple dealing with their unhappiness while living in a small fishing town, it was quickly recognized as a visionary work. 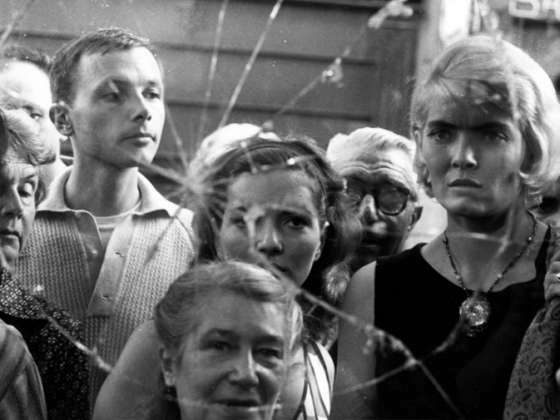 Varda went on to make many other impactful and influential films, among them Cléo from 5 to 7 (1961), about a pop star awaiting word on whether she may have cancer; Vagabond (1984), a drama about a female drifter; Jacquot de Nantes (1991), about the life and death of her husband, fellow filmmaker Jacques Demy (1931-1990); The Gleaners and I (2000), a documentary about French harvesters; and 2017's Faces Places, a documentary about her friendship with the artist JR (b. 1983) that resulted in her becoming the oldest-ever nominee for a competitive Oscar. Her final work, a TV doc about herself called Varda by Agnès, debuted earlier this year. Among her many honors and awards, Varda was the first woman to receive an honorary Oscar for her life's work as a director (2017). She is survived by her daughter, Rosalie Varda (b. 1958), a costume designer, producer, writer and actress; and her son, actor, director and producer Mathieu Demy (b. 1972).